Another father and son watching the egg toss, convey a completely different relationship. 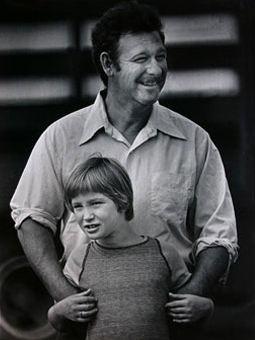 The son is older and more independent, and his hands reaching for his father’s hands are more playful and loosely curled. He no longer needs the protective custody of his father, but enjoys the close physical contact. Jack can imagine them throwing a football back and forth on a Saturday. The father will be encouraging, and let the boy tackle him to the ground in a little friendly family horseplay. Both have open, happy expressions and enjoy having time off for fun. On the way home from the fair, the boy tells his father a number of silly knock-knock jokes.